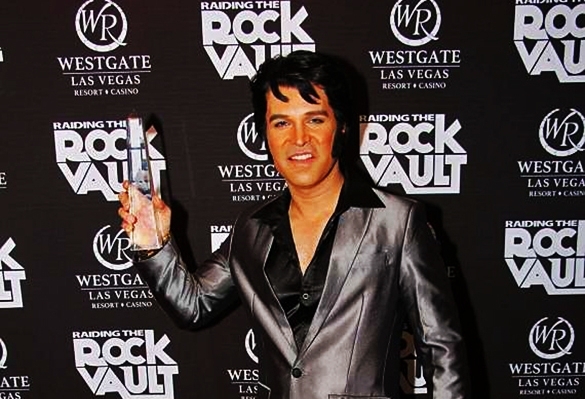 ETA Ted Torres Martin on the Red Carpet after winning The Heart of King award on Elvis's stage at the Westgate Las Vegas Resort & Casino (formerly the Las Vegas Hilton, July 17th, 2014. Photo provided by Ted Torres Martin. Q. Tell us five interesting things about your childhood. A. I grew up around the music industry because my parents were both involved in it. I loved action figures and comic books. I was a very shy kid, but was a good student. I had a very happy childhood. Q. What role did your parents play in developing your love of music at an early age? A. My parents were both recording artists, so they were a major part of it. They have always been very supportive of me and my music. A. As a teenager I had a select group of friends that I could count on one hand. I still do to this day. I could say Elvis was like my best friend as soon as I listened to his music or watched one of his movies. In school, my favorite subjects were music, science, and English. I hated math. I didn’t belong to any clubs that I recall, unless wood-shop counts. I was in the school orchestra. For fun I watched cartoons and collected comic books and vinyl records. I collected superhero action figures as well. And, of course, I played instruments and listened to Elvis. My struggle as a teenager, I guess, was overcoming my shyness. I was painfully shy, and can still be at times. Q. What did you do with your time after your high school years ended? A. I studied acting, music, and worked a lot. ETA Ted Torres Martin, March 25th, 2015. Photo provided by Ted Torres Martin. Q. What career path did you decide to take after high school? A. I have had many jobs since I was 16 years old. I always worked hard. After high school I studied for a little while. I studied acting as well. But I worked a lot as well so I could pay my bills. That was very important to me. A good work ethic comes from my parents. A. I studied classical music and music theory, as well as acting. A. In my home we listened to all types of music. It was a very eclectic blend, I must say. But I always leaned towards the oldies like Dean Martin, Elvis, Bobby Darin, and all that kind of stuff. A. I have been a performer since I was a kid. My parents were in the music business. They were recording artists, so I grew up around it. I've been playing instruments and writing songs for as long as I can remember. Q. 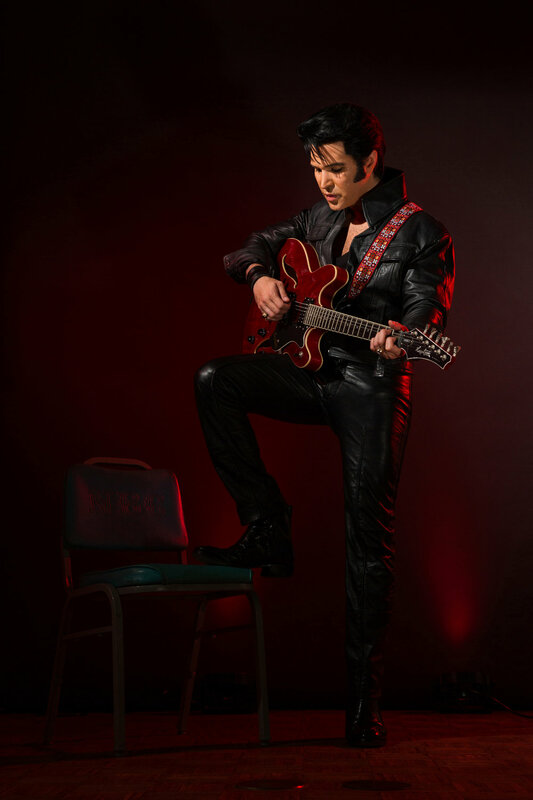 Other than playing the role of Elvis in your multimedia musical stage production, Back to Live, what other roles have you played? A. I studied acting for a while. I was fortunate enough to be in plays like "Biloxi Blues", "Death of a Salesman", "One flew Over the Cuckoo's Nest", to name a few. I like playing different characters when given the opportunity. Q. What challenges did you face in writing, directing, and acting in your own production? A. There have been a lot of challenges, and I still face some here and there. Fine tuning my original production, Back to Live, was a challenge in itself after writing the script. To find the perfect formula that worked for the public certainly was a challenge, but I believe we got it now. ETA Ted Torres Martin, Vegas, September 4th, 2015. Photo provided by Ted Torres Martin. Q. What made you decide to embark on a career as an ETA? A. I have always been a huge Elvis fan. My goal was, and still is, to act and also be an original singer/songwriter recording artist. I was almost signed to a development deal for a record label in my mid 20's which I unfortunately had to turn down because they wanted ownership of my original songs. My career as an ETA happened because people kept telling me how much I sounded like Elvis. I decided to give it a try and it stuck. I still have the ambition to do the other things I just mentioned; and I'm still trying. But I also enjoy and love my career as an ETA. A. I was nervous and scared to death! Then I felt joy and happiness once I started singing Elvis' songs. There were lots of different emotions for sure. Q. Describe the atmosphere before a competition (or performance) backstage. A. Nerves, uncertainty, anxiety...that describes most of it I guess. ETAs go through all kinds of emotions before hitting that stage, that’s for sure. Q. Describe the process of turning yourself into a stage-ready ETA. A. The process, I believe, starts from within. Mentally, you have to prepare yourself and become that person. In my act I strive for that, out of respect for Elvis, but I also try to keep a bit of myself there as well. For the look, since I do a lot of theatrical makeup tricks, it is a process that takes about an hour and forty five minutes. There is a lot of shadowing and highlighting etc. The key is to blend, and blend well, and make it look as natural as possible. I find it all a lot of fun. Q. Describe how you felt before, during, and after your first competition. Was the outcome what you expected? A. Competitions…that’s a loaded topic! I have my opinions about lots of it and what goes down. But I will keep them to myself. When you start out you win some and you lose some. You work your way up. Trust me; I have worked very hard over the years. A lot of things I still don't understand when it comes to this topic. A lot of it seems to be business. But I never give up. A. In all honesty, when they get recognition too quickly it goes to their heads. Not all guys allow that to happen, but some do. The other thing is copying other ETAs. Studying Elvis is the key. If you want to add a bit of your own flair into it that’s fine too I believe. Just keep yourself in check--always. A. My parents taught me to always do what I love, to work hard, to treat people with respect, and to never give up on my dreams. ETA Ted Torres Martin, vocalist for the soundtrack of the Elvis based independent short film NOBODY, poses with poster, October 20th, 2016. Photo provided by Ted Torres Martin. Q. Do you have tattoos? A. I do not have any tattoos. Q. One of your talents listed on your bio, is musician. What instrument(s) do you play? A. I play guitar, classical viola, some piano, and bass. I can keep a beat on the drums, but I'm definitely not a drummer. Q. Describe the highlights of your ETA career. A. Some highlights in my ETA career have been sharing the stage, and becoming friends with, a lot of Elvis's musicians and personal friends over the years. Beautiful people for sure. Also travelling the world doing what I love. Earning a World Championship and also the Heart of the King award on Elvis's stage at the old Las Vegas Hilton (Westgate). Also laying down the Elvis vocals for the fantastic indie Elvis-based short film “Nobody” just to name a few. Q. What is the best part of being an ETA? A. The best part is singing Elvis's music and honoring him with respect. A. My mom and my beautiful wife are special, supportive, and loving. Q. There are lovely photos of you and your bride on your Facebook page. How long have you been married? Would you like to tell us about your wedding day? A. We have been married for a year and a half. Our wedding was a beautiful and very special wedding for many reasons. Our wedding day really exceeded our expectations, from so many special guests to, of course, to the moment where she said, “I do.” She is the love of my life. Q. How are you different on stage compared to off stage? A. There are a lot of similarities actually. Of course on stage, I have to act a part; yet, a lot of it comes very natural because a lot of what you see on stage is also how I really am. But off stage I am ALWAYS myself. Q. What ETA title would you like to have that has so far escaped you? A. I won the Images of the King World Championship in 2016, and was honored to have done so; but of course you know what I will say...The Ultimate. Q. Would you want to judge an ETA competition? What do you think are the challenges of being an ETA competition judge? A. I would love to judge a competition. I know Elvis inside an out as a huge Elvis fan. I believe a lot of judges are very well qualified; but there are also lots times where you question it. Q. What men have been positive influences in your life? How? A. My father, God, and Elvis Presley. My dad taught me just about everything. He was a very loving, smart, talented, hard-working man--the best dad for sure. God, of course, because without Him nothing would be possible; and Elvis... well, he is very special to me for many reasons. I feel very close to him. He is my music idol. A. Betrayal, losing a loved one, unkind people, and disrespect…these things make me feel down. I just deal with it I guess. Some things weigh on a person more than others. Others things you just overcome in your own way I guess. Q. In what international cities and countries have you performed? How are audiences different in different countries? A. I have been lucky enough to have performed in Germany, Italy, Japan, Norway, Singapore, and Canada to name a few. Audiences are very different. Overseas people sometimes are a bit quieter, but it’s because they are actually listening to the singing and the music. You can see how much they appreciate it at the end of the show. Audiences are all very special in different ways all over the world. Q. Describe your experience singing with the Seregno Philharmonic Orchestra. A. It was an experience like non other to have a 65 piece philharmonic orchestra backing me up. It was like an out of body experience. It was a very special moment in my career, for sure, to have done such a beautiful concert in Italy with such talented musicians. Q. Is there a country where you really want to perform as an ETA? A. Yes. I haven't been to the UK yet. I would love to...and also Australia. A. Wow! Have to be careful with this one. I will say this without being cocky, and I assure you that I am not: I have a very level head. 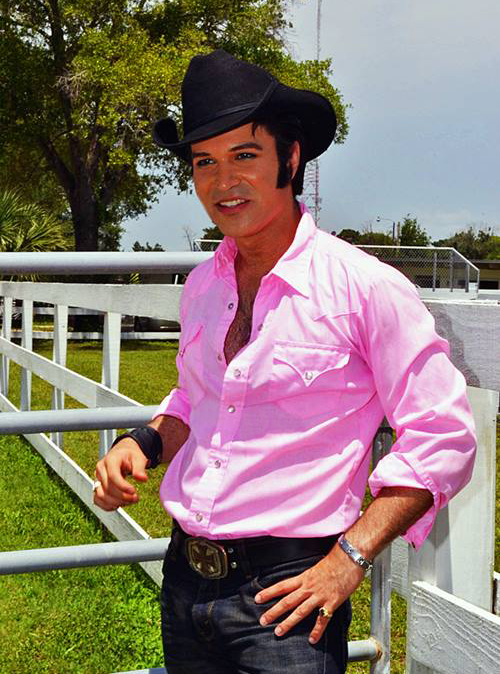 My strength is definitely my vocals, plus the respect and love I have for the Elvis fans. Q. As a songwriter, what songs have you written? A. I have written many songs over the years--close to 90. Two songs I almost sold to a major country artist at one point. Another one I had the melody stolen. As you can see it’s been tragic…lol. But I have many songs, I believe, that could be potential hits based on the feedback I have received. I am working on a project now, and I believe people will hear some original material very soon. It is still a dream of mine to make it with the original music. A. Pretty much I wake up and try to catch up with errands etc., everyday things. I try to spend as much time with my family and friends; and I try to write songs. November 6, 2016, ETA Ted Torres Martin just before his '68 Comeback Special concert. Photo provided by Ted Torres Martin. Q. If it were possible, what would you like to ask Elvis? What would you like to tell him? A. I would ask him how music makes him feel inside when he sings or listens to it. I would try to encourage him to do more serious acting and to have a healthier lifestyle. A. Time with my loved ones, good music, and performing for the great Elvis fans. Q. If you weren’t an ETA, what career would you chose? Why? A. It will always be either music or acting. That's what I grew up knowing. That's my passion. Q. What has surprised you most about being an ETA? A. It surprises me how people can be in this industry at times. It isn't always sunshine and flowers. You just have to choose which road you want to take. I always choose the high road. But there's a bit of that in every profession. Q. Describe a special moment with a fan or audience member. A. It is always special when you meet someone who saw Elvis in person or knew him and they tell you that listening to you sing took them back to that moment. That is always very special. You see, to me it is about the singing. It makes me feel like I did the job right. Q. How do you decide who receives a scarf during a performance? A. I don't. I just get out there and just do it. Q. What are sacrifices have you made for your ETA career? A. Taking lots of risks. Travelling a lot and spending time away from my loved ones is always a great sacrifice. Q. 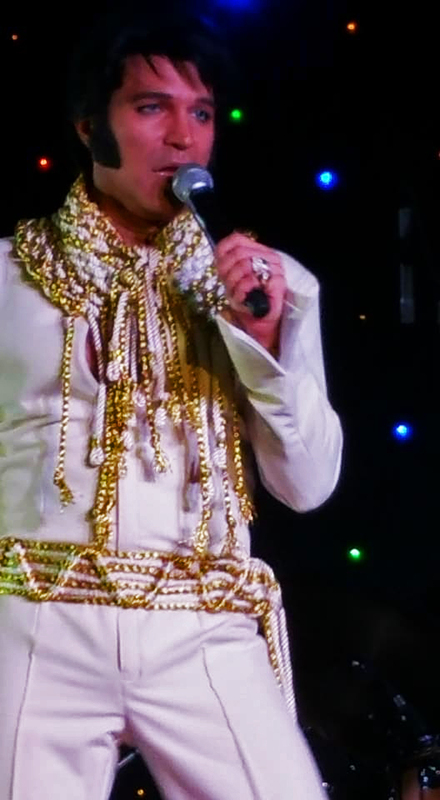 What Elvis costume is your favourite? Why? A. I love so many of them; but it would have to be a tie between the black Spanish Flower jumpsuit and the King of Spades jumpsuit. They are just so beautiful and elaborate. ETA Ted Torres Martin, October 9th, 2017. Photo provided by Ted Torres Martin. Q. How do you care for your costumes so they are always stage-ready? A. Well, I do wash them by hand and shine all of the hardware by hand. It’s quite the process I tell you. I bet Elvis didn’t have to do that himself did he? Ha! Q. Who taught you how to apply your Elvis makeup? A. You know, it's funny. In the past I reached out to people who offered to help, and then I discovered that they just wouldn't and they were never going to. Like everything else I just went ahead and learned it on my own by researching and talking to makeup artists. A great industry buddy of mine, Michael Knight, who is brilliant at portraying Michael Jackson, took the time to help me enhance what I was already doing by showing me a few new tricks. The guy is fantastic and a great human being. Q. What special care does your hair or wig require to keep it looking good? A. I could use my own hair, but I decided I didn’t want to dye it black or walk around in Elvis mode all the time. So I decided to use theatrical wigs. They are human hair, so I just wash them and clean the lace as routine. I keep them in great shape and take real good care of them. A. A world without good music. Unfortunately we are half way there. I also fear not feeling love, death, losing a loved one--many things...after all, I'm human. Q. Describe a future that is specifically designed for you. A. A beautiful and long life with my wife, and kids perhaps. My family being happy, good real friends, and a successful career in acting and original music would also be part of my future design. A. I'm not going to lie. Everyone gets upset about disappointment, no matter how much they say they don't. Some people deal with it differently. It's a process I guess. If I get a bit upset, I think things through, then I let it go and I work even harder. Q. How will you know when it is time to retire from being an ETA? A. I'm sure I will know. Guys that are in my profession should always know. A. Well, hopefully I will be successful in the things I want to do in life. I hope to be financially comfortable and just travel and enjoy life with my loved ones. ETA Ted Torres Martin, September 13th, 2017. Photo provided by Ted Torres Martin. Q. Who are the people you would like to thank for being there throughout your ETA career? A. Many people in my ETA career were very supportive of me when I started out. My parents, my friends and fans always have believed in me. I know who they are! Also people that have always been supportive in the Elvis world whom I met when I started out, like the late Gordon Stoker from the Jordanaires. A good friend that I'll always miss, Mr.DJ Fontana, was always kind and encouraging. Mrs. Marian Cocke (Grandma). She's just the best, and I love her very much. And thank you to the people who always truly believed in me. Q. What question would you ask a fellow ETA? A. Why do you do this? How does it really make you feel when you hit that stage? A. That I am actually a musician who plays a few instruments and studied music theory, and that I am an actor. Oh yeah... And that my second cousin is Erik Estrada from CHIPS. Q. What would you like to say to the backup singers and band members with whom you perform? A. I always tell them this anyhow: They do a beautiful job. Always keep doing great music. And, THANK YOU. Q. What song do you wish Elvis had recorded so you could sing it on stage during your tribute to Elvis? A. “My Woman, My Woman, My wife” by the great Marty Robbins, or “A Very Special Love Song” by Charlie Rich. A. Anything you wanted to. I'm an open book. Q. How would you answer your question? A. As precisely as possible!!! A heartfelt thank you, Ted, for consenting to be interviewed by SIDEBURNS Magazine. Your passion for life, music, and performing is evident in the answers you gave and we wish you continued success with your amazing career. Best regards, Carolyn MacArthur, Editor.